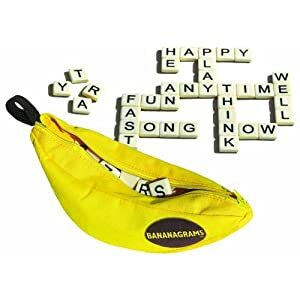 We started with Bananagrams - a fast-paced word game. It's a bit like scrabble, but quicker and more fun. 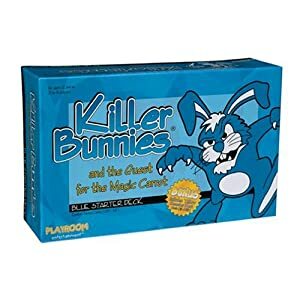 Next up was Killer Bunnies. This is a brilliant game invented by a slightly insane bunch of people. For example, you can now buy more than 10 sets of playing cards to add to the game, and some of the illustrations and information in the first set are only used when you add in the later sets. It involves keeping bunnies alive, collecting carrot cards and killing everyone else's bunnies (using weapons such as green gelatine pineapple chunks or a miniature black hole! It takes a bit of playing to get the hang of, but is well worth it. Then there was a game with Vikings in. The instructions weren't too difficult and I remember it being quite fun. I mostly remember that the Viking playing pieces were cute! If you've played Settlers of Catan and liked it, then you'll probably like this! After some pizza, we cracked out the Roborally. It's one of my favourites even though I haven't played it in ages. 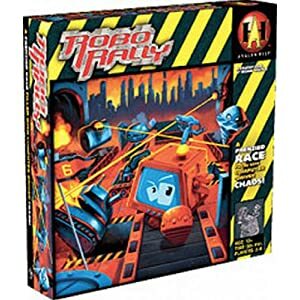 In this game you're a mini robot who needs to navigate around the board to hit different flags; the winner being the first person to hit all of the flags in the right order. It's made more complicated by shooting each other and having to plan five moves in advance. It takes a lot of thinking so even the best players sometimes make mistakes which kill their robots :) I almost won this game! The day ended with Evo - a board game involving trying to breed dinosaurs and survive different climate changes. Again, the cute dinosaur pieces helped my enjoyment; that and the noodle break we had in the middle of the game! Do you ever crack out the boardgames when friends are round?